The National Shooting Sports Foundation kicked off 2019 with its annual “Shooting Hunting and Outdoor Trade” Show in Las Vegas last week. SHOT is the largest trade show of its kind in the world. Covered by 2400 members of the media, attendees come from 100+ countries and all 50 states, infusing nearly $100 million into the Las Vegas economy annually – not counting gambling losses! With 12-1/2 miles of aisles on the show floor encompassing about 11 football fields, and tens-of-thousands of products on display, there’s a lot to cover! The following reviews some of my favorite new products – those I consider to be among the best that I found for hunters and hunting applications. 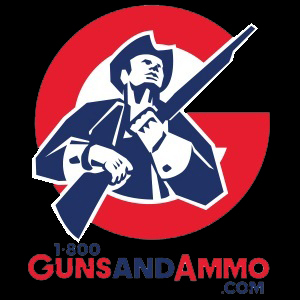 The oldest family-owned and operated firearms company in America, O.F. Mossberg & Sons, celebrates 100 years of manufacturing innovative, “hard-working” guns in 2019. With an extensive line-up of rifles and shotguns for hunting and tactical applications, Mossberg is a company you can count on to deliver a legion of new products and line extensions at SHOT. This year was no exception with more than 60 – too many to even list here! New hunting shotguns on display included a Model 835 Ulti-Mag “Tactical Turkey” model with 6-position adjustable synthetic stock in Mossy Oak Obsession camo featuring a pistol grip, 3-1/2 inch chamber, and 20-inch barrel with X-Factor ported “turkey” choke tube (MSRP: $635.00). Additional new shotguns for turkey hunting include an overbored Model 935 Magnum Turkey 12-gauge autoloader (MSRP = $756.00), and Model 500 pump in .410-bore (MSRP: $500.00), both featuring ventilated rib barrels and MO Obsession camo. New Mossberg Model 835 Ulti-Mag “Tactical Turkey” model in Mossy Oak Obsession camo. Eye-catching new rifle models included Patriot line expansions like the 450 Bushmaster Predator model, with 16-1/4 inch barrel and Picatinny rail for mounting optics (MSRP: $441.00), and the Night Train model in 6.5 Creedmoor, with 24-inch fluted barrel, bipod, and 6-24x50mm scope (MSRP: $794.00). Both rifles come with matte blue barrel finish and Flat Dark Earth synthetic stocks. A new Model 500 2-Barrel Scoped Combo, with both ventilated rib Field barrel and ISB/Cantilever Slug barrel, is available in both 12- and 20-gauge. A 2.5x20mm Dead Ringer scope and Dual Comb stock with interchangeable high- and low-profile combs are included (MSRP: $454.00). Another exceptional hunting value is the new FLEX 500 Youth Combo Field/Deer model, featuring both 22-inch, 20-gauge dual field barrel with Accu-Set choke and 24-inch, fully rifled slug barrel with adjustable sights. FLEX Dual Comb Stock offers 4 adjustable positions and combines with EZ-Reach forend to create configurations perfectly suited for youth and other small stature shooters (MSRP: $531.00). New Mossberg Patriot Night Train model in 6.5 Creedmoor, with bipod, and 6-24x50mm scope. 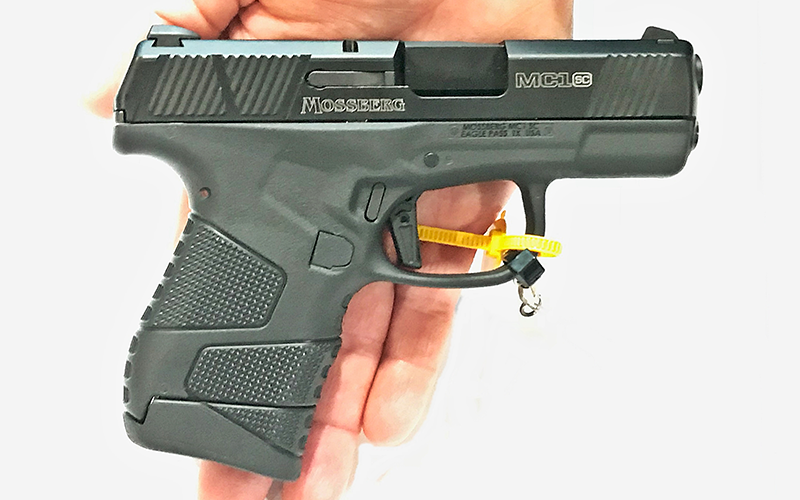 Without question, the biggest news from Mossberg is the introduction of their MC1sc Subcompact 9mm Pistol, in celebration of their centennial. Designed for concealment, this feature-rich little beauty has a slim, “dehorned” profile to allow a quick, snag-free draw, and aggressively textured grip panels with palm swell for a natural feel and added control. Its lightweight (22 ounces, fully loaded) and durable polymer construction makes it an excellent everyday carry choice. 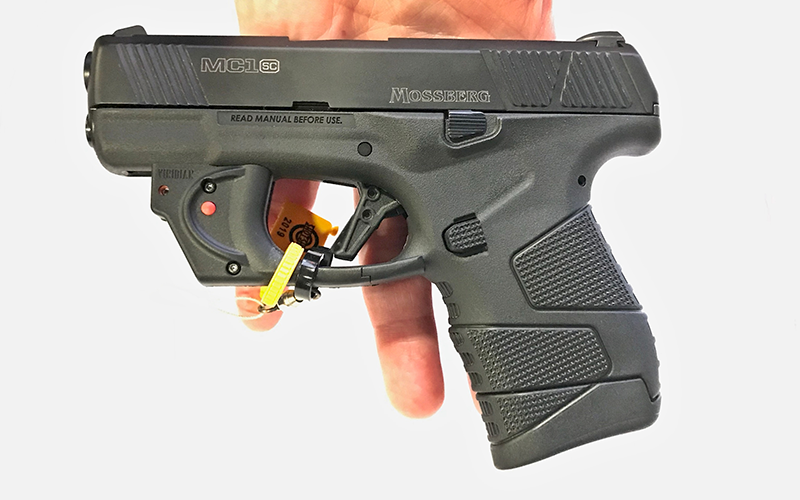 The MC1sc also features Mossberg’s exclusive Safe Takedown System, which requires the user to make the pistol safe by removing the striker assembly before removing the slide, so no trigger pull is required for disassembly and cleaning/maintenance. Each MC1sc is delivered with 6-round flush and 7-round extended Clear-Count transparent polymer magazines that allow at-a-glance assessment of the number and type of rounds loaded. With its “Built to Carry, Made to Protect” slogan, the MC1sc obviously falls outside the hunting realm. Nevertheless, this feature-rich subcompact available in 5 models deserves all the attention it will get. Look for a full product review and field-test in this blog space soon. MSRPs: Base Model ($425.00), Cross-Bolt Model ($425.00), TruGLO Tritium Pro Model ($526.00), Viridian Laser Model ($514.00) and Commemorative Centennial Model ($686.00). Street prices will likely be even lower! New Mossberg MC1sc Base Model. 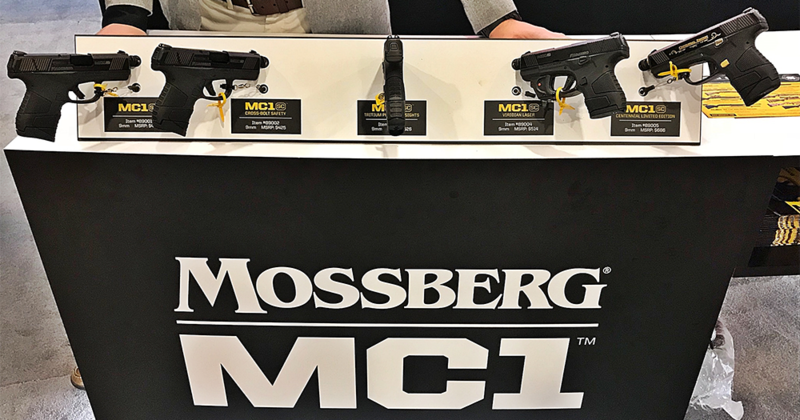 New Mossberg MC1sc Crossbolt Safety Model. 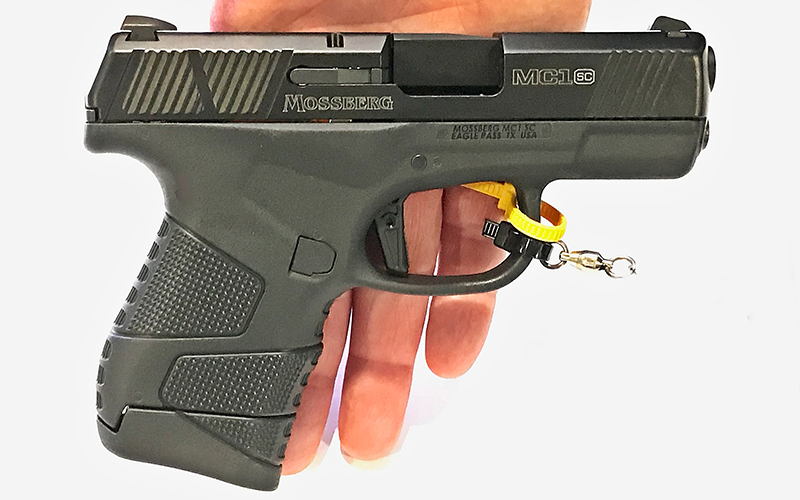 New Mossberg MC1sc Viridian Laser Equipped Model. 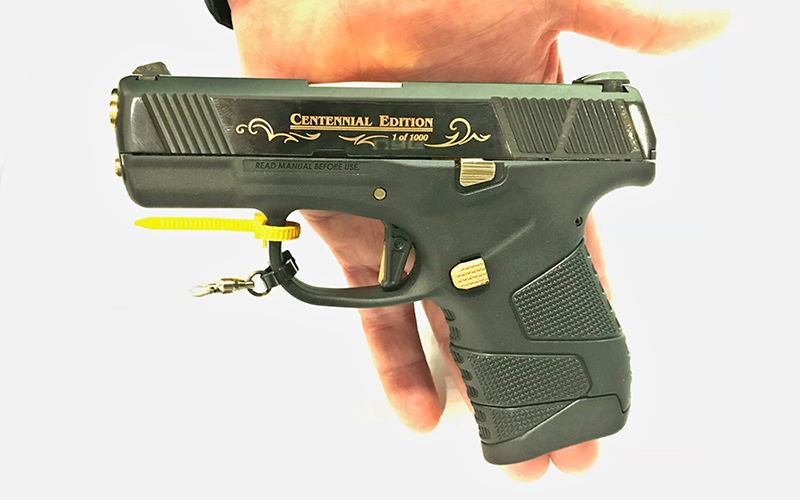 New Mossberg MC1sc Centennial Limited Edition Model with gold accents. SITKA has made their mark in the outdoors world by “Turning Clothing Into Gear,” accomplished through innovation and technological application to produce premium performance clothing lines. This year they came to the big show with dozens of line extensions and new products. Most notable were additions to their Youth line and Hunt Solids lines for both men and women. As people come to recognize the benefits of performance clothing while hunting, many wish to apply these benefits to everyday life, sans camo. This has spurred growth of this market, with SITKA as an established leader. 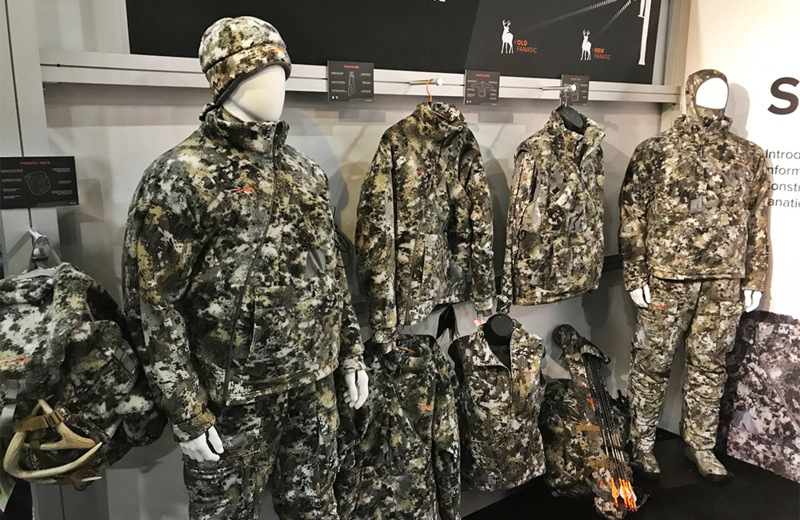 Featured at SHOT 2019 were redesigned “Fanatic” hunting garments in the popular Whitetail line. Available as a complete “system” that significantly reduces fabric noise by up to 50%, components include bib, jacket, vest and a pack. 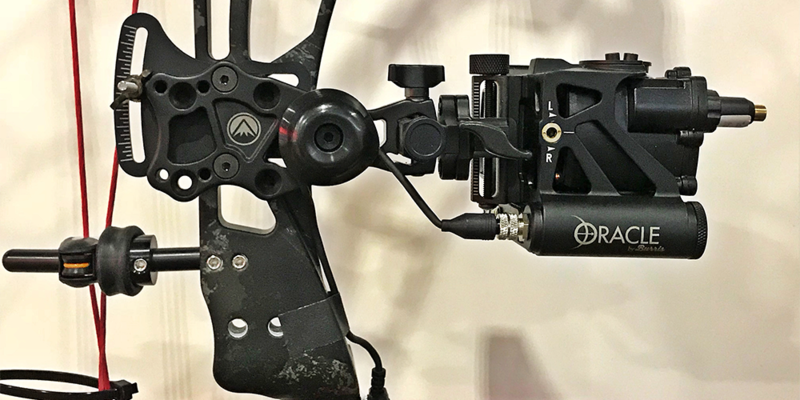 SITKA claims the fabric noise reduction “has been proven to cut the audible engagement distance in half” – a tremendous advantage for treestand hunters! Ultra-quiet fabrics like Berber fleece, and Gore-Tex Infinium with Windstopper Technology combine and compliment to make garments both quieter and warmer. Zippers have been updated to reduce noise and pockets relocated to reduce bulk. 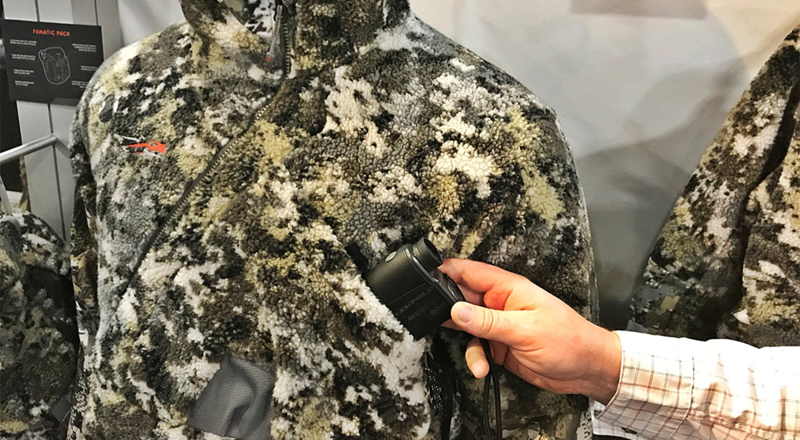 And, new “body-mapping” of the Primaloft Silver Insulation traps body heat where you need it, while facilitating mobility – a SITKA Gear hallmark. The new Fanatic Bib (MSRP: $439.00) features a new burr-resistant fabric that resists pesky vegetative adhesion without sacrificing noise reduction. The new Fanatic Jacket (MSRP: $449.00) is available in versions for both left- and right-handed shooters, with an ultra-quiet diagonal zipper design and sleeve patches to dampen the sound of string slap for bowhunters. 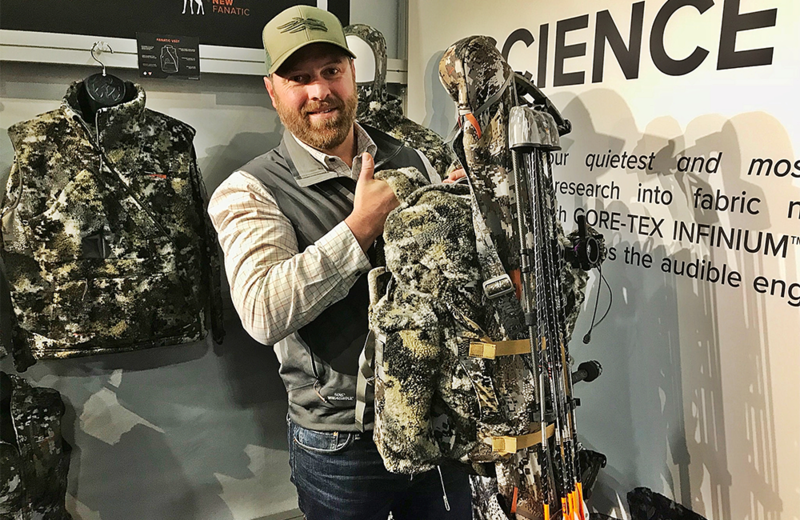 Other features include a rangefinder pocket with magnetic closure, zippered front hand muff, and patent-pending Constant Connect Safety Harness Port at the back of the neck – which allows hunters to adjust layers easily while keeping the safety harness tethered to the tree while on-stand. Thoughtful rangefinder pocket in the new SITKA Fanatic Jacket. Did I mention “turning clothing into gear?” Touted as SITKA’s “quietest windproof top” the new Fanatic Vest (MSRP: $279.00) is silenced with High Loft, wet printed Berber fleece, warmed by Primaloft, sealed with Gore-Tex Windstopper, and it’s perfect for layering. The new Fanatic Pack (MSRP: $199.00), with no exposed plastic buckles or other parts, is SITKA’s quietest ever – completing the “system.” Features include “silent-secure” side pockets, “quick-draw” top lid closure, both stabilization and winged compression straps with “silent-secure” hooks, dedicated saw/bow hanger side pocket, and ultra-quiet zipper. Shown in the Gore Optifade Elevated II camo pattern, the Fanatic System will be available this summer (2019). SITKA Gear Representative Banning Collins shows the new SITKA Fanatic Pack. There were several new rangefinder/binocular units introduced at SHOT 2019, most notable was the RBX-3000 TBR/W from Leupold. It appears that these multi-function optics are evolving into two categories; 1) basic rangefinders with angle compensation based on simple mathematics coupled with a good quality binocular, and 2) advanced rangefinders capable of factoring atmospheric and ballistic data into more precise ranging distances, coupled with top-of-the-line glass. According to Tim Lesser, Vice President of Product Development for Leupold: “The RBX-3000 TBR/W has been developed from the ground up to deliver the ultra-premium performance the Leupold brand is known for.” And, with a reported selling price when they’re released this spring of about $1.00 per yard ($3000.00), it’s clear this new Leupold offering will compete in the premium category in this rapidly expanding market. The RBX-3000 TBR/W is purported to deliver incredibly accurate ranges with its True Ballistic Range/Wind (TBR/W) technology. TBR is Leupold’s compensation system that factors the shot angle, and rifle ballistics into a hold-on distance solution. The RBX-3000 features easy-to-read, high-contrast data on a red LED display, adjustable with a diopter on the left eyepiece. An on-board atmospheric sensor displays temperature, air pressure, and humidity – just add your favorite smartphone-based ballistics app if desired to fine-tune range distances out to 3000 yards on reflective objects, and 2600 yards on trees and “soft” targets. 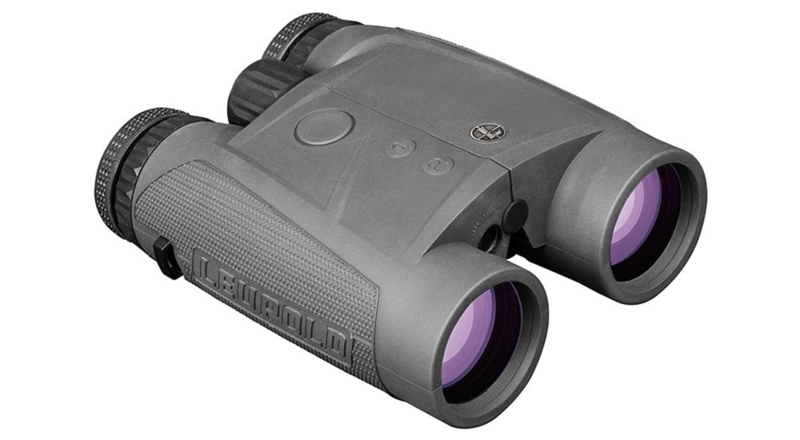 The binocular features Leupold’s Twilight Max HD Light Management System – the same system associated with the company’s award winning VX-5HD and VX-6HD riflescopes. Twilight Max HD combines exceptional light transmission and glare management to provide sharp images with top-line optical performance, particularly in low-light conditions. The result is functional use that extends from predawn darkness to well past dusk. The robust 10x42mm waterproof and fogproof unit weighs 36 ounces, and is housed in aircraft-grade aluminum for rugged durability, with a Shadow Gray finish. 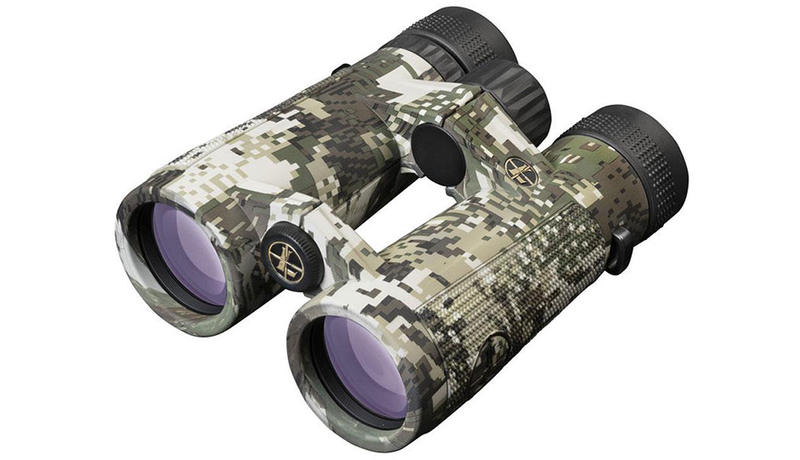 Another eye-catcher from Leupold was the BX-5 Santium HD binocular line, now with 5 models in both Shadow Gray and Sitka Gear’s Sub-Alpine camo finish. Though not inexpensive, this optic line offers a great deal of performance for the buck. Internally, the BX-5’s feature BAK4 phase-coated, Abbe-Koenig roof prisms, just like top-line European models costing 2-3 times more. This design eliminates the need for costly mirrors and yields the brightest images. Extra-low dispersion HD glass minimizes an effect called “color fringing,” for a sharper image that helps to distinguish fine detail. If you’re an antler tine counter, you want HD glass in your bino. Optical quality of the BX-5’s is supported by fully multi-coated lenses, to maximize light transmission while minimizing glare. The result is bright imaging with high contrast. BX-5 Santium HD binoculars are available in 8x42mm (MSRP: $1,494.99), 10x42mm (MSRP: $1,559.99), 10x50mm (MSRP: $1,624.99), 12x50mm (MSRP: $1,754.99), and 15x56mm (MSRP: $1,819.99), with street prices about 20% lower, and camo models slightly higher. I was particularly impressed with the big 15x56mm, which are popular with sheep, goat, pronghorn and deer hunters in big country, as they can save miles of walking. Although at their best when mounted on a tripod, I found that handholding the big BX-5’s provided a remarkably stable image. 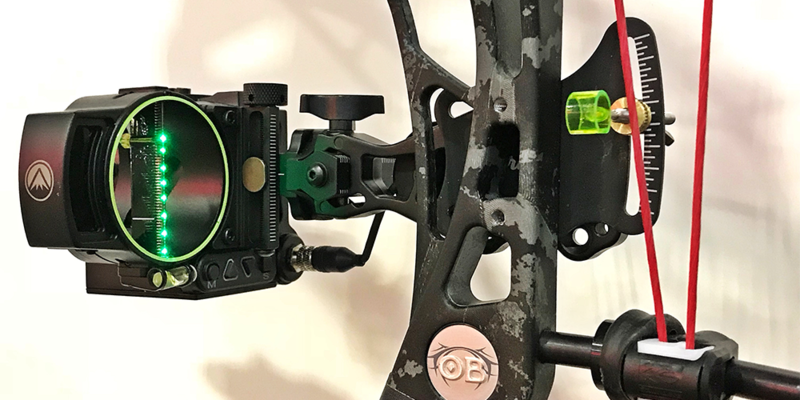 Best known for their premium optics for sporting, tactical and military applications, it was somewhat surprising to find that the featured product from these companies at SHOT 2019 was a bow sight! The Burris Oracle Rangefinder Bow Sight was built on technology developed for their highly successful Eliminator laser rangefinding riflescope, the “undisputed leader in automatic trajectory compensation sights.” By incorporating a laser rangefinder into the bow sight, the need to guess distance or aim between pins is eliminated, as is the chance of using the wrong pin. Here’s how it works: Sight in the bow and arrow combination at 20 yards and two longer distances, and Oracle then calculates the entire arrow trajectory curve. Depress the easy-push button mounted on the riser at full draw, and the internal rangefinder measures the distance to the target. It instantly calculates the exact aiming point that compensates for both distance and shot angle, and then displays it with a bright LED on a bar centered in the sight. Up to 176 MOA of adjustment, equivalent to 184 inches of arrow drop at 100 yards, is accommodated. Sight construction is all aluminum, so there is no glass that can scratch, glare or fog up. A fixed reference “failsafe” 20-yard pin is displayed on the LED bar. A rear peep is included for precise aiming that improves low light visibility and also helps eliminate grip torque. Thus a string peep is unnecessary – but if used, it will add a third reference point at the rear of the sight plane. Other features include a bubble level to minimize canting, and locking micro-adjustment knobs as well as third axis adjustments. And, Oracle can store two different trajectory curves for different weight arrows and/or draw weights. It accommodates both right- and left-hand shooters, and arrow speeds from 200 to 420 feet-per-second. The water-resistant 17-ounce sight is powered by a CR123 battery that provides 1000-2000 activations, and is fully covered (including electronics) by the Burris “Forever” warranty that is transferable to future owners! MSRP: $799.00. Note: Several western states (ID, MT, OR, UT, WA, WY) prohibit use of electronic bow sights, so be sure to check regulations in the state(s) you hunt. Waterfowlers rejoice! 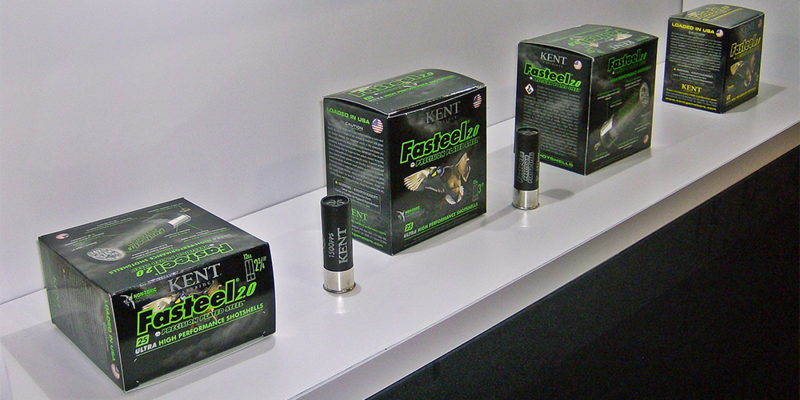 Kent Cartridge Company – known for manufacturing high quality yet affordable, high performance, non-toxic hunting loads for more than 20 years – exhibited an improved version of their popular Fasteel ultra high performance waterfowl loads at SHOT 2019. Fasteel 2.0 Precision Plated Steel features top quality components to help resist corrosion while maintaining exceptional high performance. Top-line shell components include precision ground zinc-plated steel shot, high-performance base-wads, premium shot-wads, and nickel-plated case heads that produce excellent patterns. Custom blended low-flash Alliant powders, and ultra-reliable CX2000 primers insure clean burning consistency. Velocities for popular 12- and 20-gauge loadings have been increased without increasing felt recoil. Available in 2-3/4, 3 and 3-1/2 inch loadings for 12-gauge with shot sizes from smallish #6 through BB, and in 3-inch loadings for 20-gauge with shot sizes #2, #3 and #4. 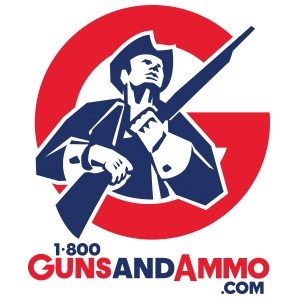 MSRP’s range from $15.00 to $24.00 per box of 25 shells. And, Kent did not forget turkey hunters! The West Virginia-based company also introduced ultra high-performance tungsten turkey shotshells. The new TK7 Penetrator loads feature #7 tungsten-iron pellets, blended to a density of 15 grams (g) per cubic centimeter (cc). This is less dense than 18 gram/cc TSS (Tungsten Super Shot), but still 38% greater in density than lead. Kent’s TK7 gives turkey hunters the opportunity to experience the incredible performance of tungsten without paying $10.00 per shell! Loaded with a proprietary process that buffers the shot, extremely dense patterns are delivered at virtually all distances. The 12-gauge loading contains 1-5/8 ounces of shot, and the 20-gauge loading has 1-3/8. Both leave the muzzle at a comparatively slow 1,100 feet-per-second for tighter patterns and a bit less recoil, but the density of the pellets insures that plenty of energy is delivered downrange. Furthermore, the TK7 payload of #7 tungsten-iron provides 60% more pellets in the pattern than an equal weight of #6 lead. MSRP: $29.00 to $32.00 per box of 5 shells. 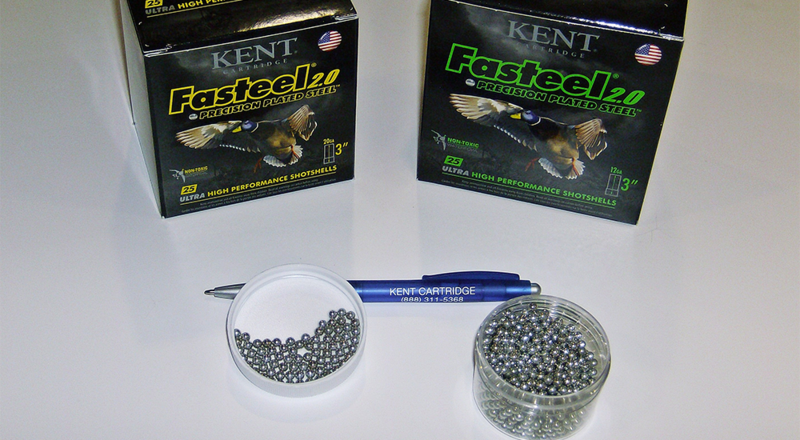 New Kent Cartridge Fasteel 2.0 with precision ground zinc-plated steel shot. I’ll admit that I have little experience with Leica optics, but as my Texas born-and-raised spouse would say “that’s fixin’ to change,” with introduction of the new top-of-the-line Rangemaster CRF 2800.COM laser rangefinder. Known for its superb glass that produces brilliant, crisp and highly detailed images as well as its top-line laser rangefinding capability, Leica now gives users the ability to input personal ballistic data with a smartphone hunting app for a precise target distance/holdover solution with the new Ranagemaster CRF 2800.COM. And, Bluetooth connectivity with a Kestrel Elite Weather Meter allows wind direction and speed, temperature and barometric pressure to be factored into a precise shooting solution in the field, based on real-time weather conditions. Leica calls it “ballistics unleashed.” I call it remarkable capability in a competitively priced (MSRP: $1099.00), easy handling, compact design that weighs only about 40% of a pound of feathers. The 2800.COM delivers precise laser distance measurements up to 2800 yards, with an ultra-fast scan mode that updates every 0.3 seconds. Three output formats are available with use of Leica’s smartphone hunting app – holdover, Equivalent Horizontal Range (EHR) for uphill/downhill compensation, or the number of clicks required to put the shooter’s riflescope precisely on target. Before going afield, hunters can use the app to upload one of twelve different standardized EU (metric) curves, or generate a personally customized ballistic profile for their favorite rifle/caliber/bullet combination. The 2800.COM’s LED display features automatic brightness control and a generous field-of-view. And, AquaDura lens coating repels dirt and water from the waterproof unit. Look for a detailed product review of the new Rangemaster 2800.COM in this blog space soon. If you hunt and venture off road in your truck, Jeep, or ATV/UTV, you will eventually get stuck in mud, sand or snow. For years sportsmen have used all types of chains, cables, straps and even old fire hoses as recovery tools. Personally, I cannot remember how many of these items I’ve seen break – sometimes dangerously – in failed recovery attempts over the years. 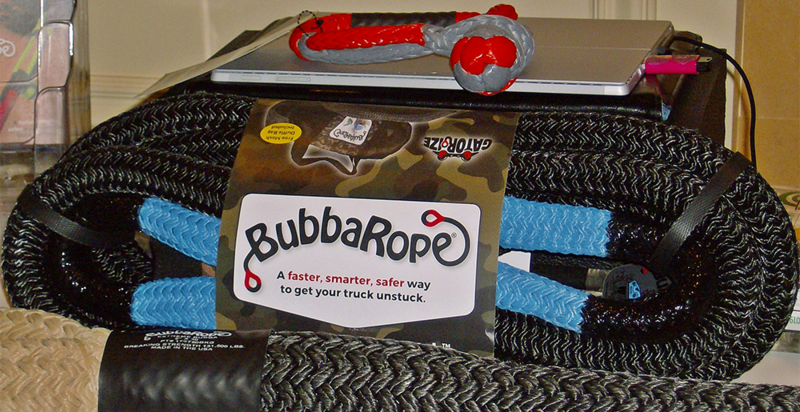 Bubba Rope recovery gear is simply “a faster, smarter, safer way to get your truck unstuck.” Although not a new company, 2019 was the first time Bubba Rope has exhibited at SHOT. Established about 10 years ago by Certified Slings, Inc. (CSI) – manufacturers of expandable nylon rope used by U.S. Military for helicopter transport of cargo and vehicles like Humvees – Bubba Rope quickly made its mark with awards at the prestigious SEMA (Speed Equipment Manufacturing Association) Show. 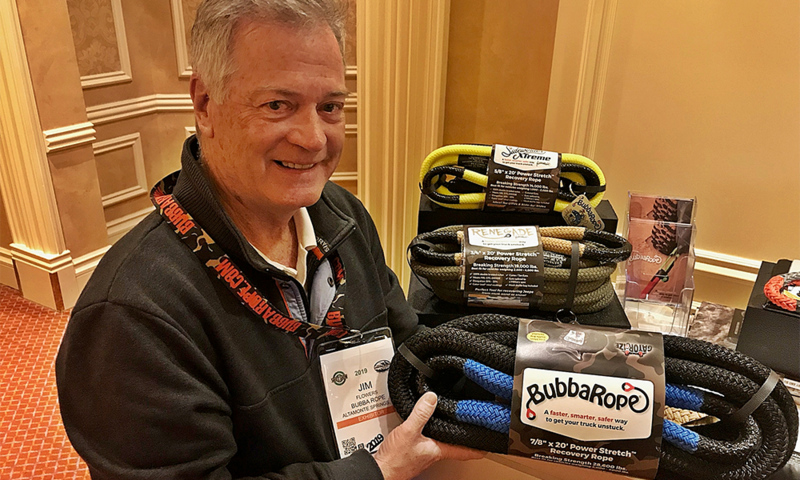 General Manager Jim Flowers with a selection of Bubba Rope recovery gear. On display at SHOT was a selection of the namesake recovery ropes and Gator-Jaw synthetic shackles. Bubba Ropes are made in the USA to military specs from 100% high strength double-braided nylon, with excellent shock absorbing properties. A vinyl coating protects the nylon from abrasion as well as UV light and water. Rope “eyes” are avaliable in several colors, with wear points further protected by “Gator-ize” coating. A durable ID sleeve with specifications is attached, and each Bubba Rope comes with a mesh storage bag or carrying case. Available in 20- and 30-foot lengths, the 7/8-inch diameter Original Bubba Rope is ideal for 4×4 trucks and SUVs with a break strength of 28,600 lbs. (MSRP: $169.00/20 ft.). The 3/4-inch Renegade is perfect for Jeeps with a break strength of 19,000 lbs. (MSRP: $139.00/20 ft.), and the 5/8-inch Sidewinder Xtreme with a break strength of 14,000 lbs. is ideal for ATV/UTV and side-by-side applications (MSRP: $95.00/20 ft.). Sound pricey? Not when you consider these ropes will last a lifetime, and may even save someone’s life! Gator-Jaw synthetic shackles were developed as a means to remove all metal from the recovery process. Awarded “Best New Off-Road Product” at SEMA in 2015, these shackles are made from Plasma – which is stronger than steel and the highest strength synthetic rope available, yet so light that it floats! This is a great asset in liquid mud, where steel shackles sink. Security is provided by the button knot, which works with a self-tightening loop that will not slip off during use. A proprietary vinyl urethane coating process adds protection, and ID sleeve is included. And if that’s not enough, every Gator-Jaw is tested before it’s packaged and shipped. Available in various sizes and break strengths, the Original 7/16-inch Gator-Jaw (shown) is ideal for 4×4 trucks, SUVs & Jeeps, with a break strength of 32,000 lbs. (MSRP: $42.00). The Original Bubba Rope with Gartor-Jaw synthetic shackle (above). In Part 2 we will take a look at new products from Beretta, Eberlestock, ARCUS Hunting, Athlon Optics, and a few more companies.